Do you often get gastrointestinal pain or symptoms after eating certain foods? Things like bloating, gas, diarrhoea, cramps or constipation? The link between digestive disorders and food intake is well recognised, and there is a strong chance that FODMAPs are responsible for your food intolerance. If you are someone who is poor at digesting those saccharides and polyols (a food intolerance), they will ferment in the lower part of your large intestine (bowel). This fermentation process draws in water and produces carbon dioxide, hydrogen, and/or methane gas that causes the intestine to stretch and expand. The result is strong pain, visible abdominal distension, gas and other related symptoms (1). A low FODMAP diet refers to a temporary eating pattern that has a very low amount of FODMAPs. Fibromyalgia or other health issues you’ve noticed are triggered by certain foods. For 3-8 weeks (depending on how you respond) you will limit or exclude all FODMAPs from your diet. This is known as the elimination phase. After this time you then begin the reintroduction phase – reintroducing each FODMAP type one at a time to see what triggers symptoms. For example, you may first reintroduce fructose (a type of sugar) for one week. If you have no symptoms, you may then reintroduce lactose too, and so on. Once the trigger FODMAPs have been identified, you will know what you can and cannot eat. The low FODMAP diet is the only clinically proven treatment for food intolerance such as IBS, with the overall average success rate about 68-76% (2, 3). While gluten can also be a trigger food for a handful of people – especially those with hypothyroidism – it is a protein, not a carbohydrate. Therefore gluten cannot be classified as a FODMAP. However, gluten-free products tend to be lower in FODMAPs anyways. 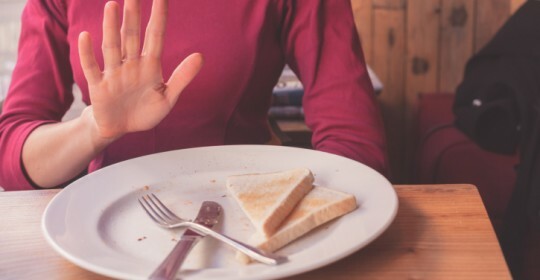 If you suspect or know you have a food intolerance – and it is starting to affect your day-to-day activities and quality of life – then you need to get on top of it. For best treatment and to try a low FODMAP diet for yourself, come see us here Darwin Dietitians. Simply call us on 08 8927 3700 or enquire online here.